This post is both a shameless self-promotion (it’s my blog, so where else would I do this, right?) and hopefully something for you writers out there to think about when it comes to writer’s block. 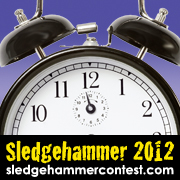 A week ago I participated in the Fifth Annual Sledgehammer Writing Contest. The contest combines a scavenger hunt with a 36-hour creative writing competition. The goal of the contest is to creatively inspire writers to break through their writer’s block (hence the sledgehammer). I wanted the story to begin with a lighthearted tone. The main characters are teenagers–listless, on summer vacation, and looking for something to do. By the story’s end, the plot has taken a turn and a dark reveal is made. I feel proud of how the story turned out, especially considering that I churned it out in less than 36 hours. Had it not been for this competition, I probably never would have come up with the idea for the story. That is what was so great about competing in this contest (the prize packages for the winning stories don’t hurt either): through a fun activity and a series of writing prompts I wouldn’t have considered on my own, I was able to come up with a brand new story. In a weekend! Writer’s block falls on all of us writers at some point or another. That’s why I am thankful for opportunities like the Sledgehammer Contest. I highly recommend you try something like this. The contest may be over, but it doesn’t mean you can’t try these writing prompts out yourself. Or attend a workshop. Or sign up for a newsletter that gives writing prompts. Pacific Northwest writer Midge Raymond has a newsletter that always comes with a writing tip and prompt (go here to sign up: http://www.midgeraymond.com/subscribe.html). I also suggest trying out a rigid self-imposed deadline. I write the occasional newspaper article at PSU, and I love writing under a deadline because it means I can’t procrastinate. Try the 36-hour challenge yourself some upcoming fall weekend when the weather forces you to stay inside. You don’t have to use the same prompts, but I guarantee you will be proud of yourself if you finish (the first draft of) a short story in one weekend. The last time I rode the bus between my hometown of Yakima, Washington to Seattle, I made myself write a story in that three-hour time frame. The idea came to me while in Yakima, and I knew that if I didn’t give myself a deadline, I’d put the idea aside once I returned to work and school and real life (and all the other things that get in the way of our writing). So try something, anything to beat that writer’s block. Sometimes you have to get creative to get over the fear of the blank computer screen. And if you’re feeling especially kind after breaking through your writer’s block, please visit http://sledgehammercontest.com/, read my contest entry “Hooliganism,” and vote for me to win the Reader’s Choice Award. Next Post The End is Near! Thanks for the comment, Samantha. I’m glad it inspired you. I know how hard it can be to get out of a writing rut, that’s why you have to be willing to try everything. Have you looked into NaNoWriMo (nanowrimo.org)? I’ve took up the challenge this month. You should consider something like this. It never hurts to try. I think the novels may go up on the NaNoWriMo website, but I’m not sure. I’ll be submitting mine soon (one day until the end of the month), so I’ll find out soon.